Persons with disabilities account for around 6% of all Sudanese citizens. Although there are specific policies and laws aimed to enhance our inclusion, we are discriminated within our communities in relation to access to services and enjoyment of our rights. The main challenge we face is the lack of awareness of our specific rights. Therefore, at present, civil society associations are actively working to make persons with disabilities in Sudan aware of their rights, while advocating for policies and laws to promote them. In Sudan, in addition to associations dedicated to each type of disability, there is the Organization of Women with Disabilities, which includes all women regardless of the type of disability. This organization, whose objective is the social inclusion of women with disabilities in their communities, works as a network that boosts the exchange of experiences among women with disabilities, so that we can know the specific needs of their partners and support each other. There are many successful stories resulting from the work of this organization that works to make the rights of women and girls with disabilities effective. A concrete example is the case of a woman who asked for our help to access the University because the Faculty of Education refused her entry, arguing that she could not be a teacher because her disability prevented her from hearing the students. Faced to this situation, the organization went to the University to solve the problem and allow she could continue studying, which we hope will allow her to develop her professional career as a teacher in the future. The access to employment for us women with disabilities is still limited in Sudan. Hence, in the Organization we value very highly the work we are developing together with Bridging the Gap II (BtG-II), the EU-funded project coordinated by the FIIAPP and implemented in Sudan by the Italian Agency for Development Cooperation (AICS). In particular, thanks to BtG-II, we are working in the state of Gedaref to strengthen the employability capacities of women with disabilities and mothers of children with disabilities from rural areas and, therefore, increasing their chances of finding a job or creating business opportunities and cooperatives. These trainings also promote the awareness of instructors, families, and persons with disabilities about the right to education and the inclusion of women with disabilities in the labour market, which benefits society as a whole. They also work to create a better environment, better accessibility and equipment, and to deal correctly with persons with different types of disabilities. In general, the Sudanese society considers disability as a stigma. Many people hide their children with disabilities from friends and family. They are afraid of having children with disabilities, especially girls, because they believe that they will not be able to protect themselves, for example, from sexual abuse. So, they keep them inside the house, which turns into a prison for them. Access to education and, subsequently, to the labour market, becomes therefore a liberating experience. As president of the Organization of Women with Disabilities in Sudan, I think it is very positive that Bridging the Gap II works with government authorities as well as with people with disabilities themselves and their organizations. This is of great help for the Sudanese society to reduce the gap between people with and without disabilities and to give actual implementation to what is reflected in policies and laws. In this sense, the role of civil society is key since the institutions of the country usually request their support when they have to address disability issues because officials are not prepared to deal with persons with disabilities. In this sense, the National Council for Persons with Disabilities is currently working on a Strategic Plan for Persons with Disabilities in Sudan which, once approved by the Government, should be adopted by all Ministries. 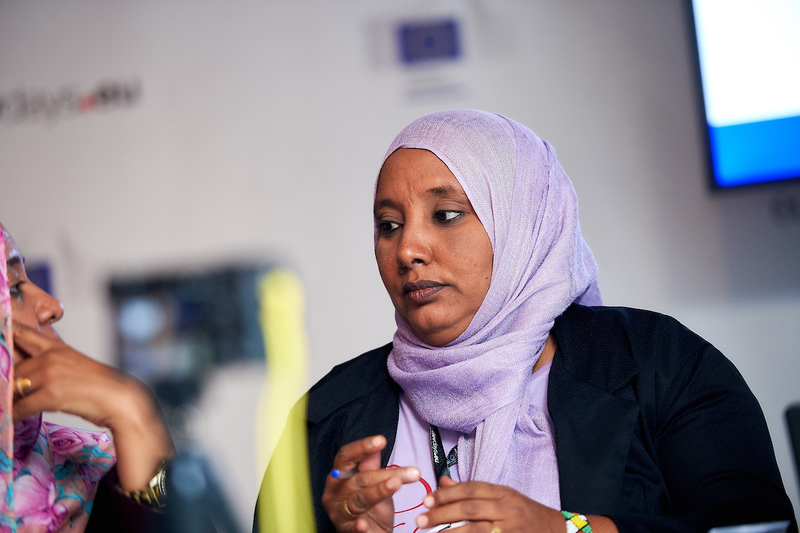 Bridging the Gap has the backing of national institutions and is in line with Sudan’s development strategy, which includes support for the social inclusion of persons with disabilities. That is why we hope that this project will also help strengthen the participation of national civil society organizations and organizations of persons with disabilities in policy formulation processes. From the Organization of Women with Disabilities we will continue working so that these inclusive policies pay special attention to women with disabilities.